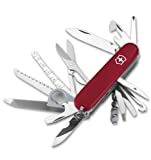 Amazon.com has the Classic Swiss Army SD Pocket Knife in translucent blue and red for $9. Knife blade, scissors, a nail file with a screwdriver tip, a removable plastic toothpick, and removable tweezers. * 58mm * Color: Ruby Translucent * SwissMemory 128 Contains the Following Tools: Removable USB Flash Drive with 128MB Memory Capacity Blade Nail File with Screwdriver Scissors Key Ring LED Mini Light Retractable Ball Point Pen * Compatible with: USB 1.1/2.0 interface Windows 98SE/ME/2000/XP MAC OS X, OS 8.6 and higher Linux 2.4 and higher * Windows 98 drivers available at www.swissbit.com/drivers * The Secure-LOCK software will keep your data safe from unauthorized access. www.swissbit.com/securelock. * LAST 2! Not as cool as the MemoryStick/VOIP phone, but still neat stuff. They'll put USB on anything now in days. Comes in 128MB, 256MB, and 512MB versions. Everybody needs a good knife. Here's a Deal on a nice one.